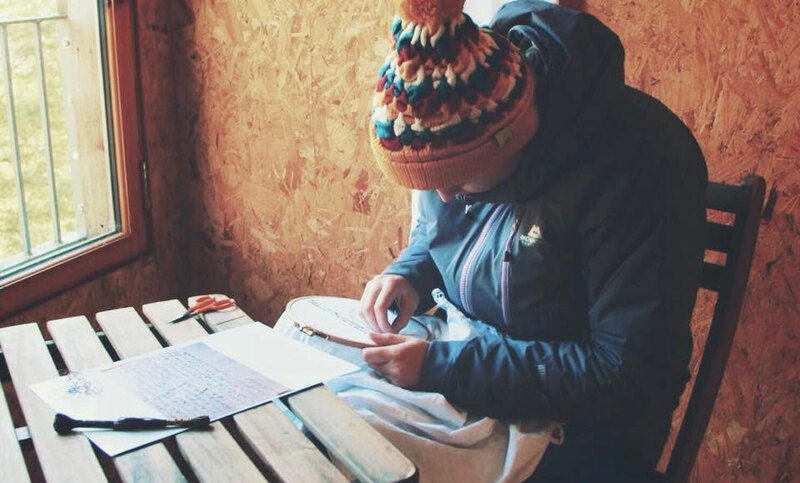 Claire Macleod explored clans, calligraphy & culture during her Outlandia residency. "The stories of people who have lived in the glen through ages and generations was especially interesting, and having studied these stories and met some of the people who have lived in the glen in the past century, I cannot fail to see the place in the context of these stories. This is especially true when walking across the Peat Track, past the pathway into Outlandia and down into the glen. It is because of the Nevis area that I moved to Lochaber and is a place I hold very dear. I have been on the Board of Trustees for a charity called Friends of Nevis since 2011, whose aim is to help the local community look after and manage Ben Nevis and the surrounding landscape. In the past year I have enjoyed exploring grafted calligraphy and would like to work with words and stories from people who have lived in Glen Nevis, giving them a voice, using text and textiles. Although I am mainly involved in design and film, I would welcome the opportunity to explore stitched word further".